Finding the right dress for a special occasion can often be difficult and even though I'm a fashion blogger, I still have days where I can't find anything to wear. My wardrobe is cluttered and overflowing with dresses, but there are days that some of my existing outfits just don't suit the occasion. Yesterday was one of those days. Yesterday I attended the Manchester Bloggers Meet which was held at the prestigious members only bar, The Milton Club. It was such a fantastic day with lots of activities the wonderful host Lucy designed to keep us entertained. When I woke up that morning, I did not have a clue what to wear and despite owning a large amount of dresses, I struggled to find the perfect outfit. I arrived at the Milton Club full of glamorous bloggers feeling frumpy in my little white cotton dress. The problem was that it was too hot to wear most of the dresses I currently own and the ones I wanted to wear were in the wash from the parties and nights out I had attended over the week. Luckily for me, a brand called Didi's Boutique (link) was showcasing at the Manchester Bloggers Meet and generously gave us all 50% off the clothes they had on their stall. After browsing through the racks, I came across this gorgeous little pink polka dot and realised it was the dress I had been wanting to buy a few months ago, but never got the chance. Instead of being £45, I bought this dress and another for just over £35. The dress and I were meant to be. Like Cinderella going to the ball, I quickly ran to the toilets with my purchase and changed my outfit. When I walked into the room full of bloggers, I was greeted with compliments and everyone loved my new outfit. I love the jagged petticoat beneath this dress and the retro vibe the dress gives with the white polka dots. The dress is so comfortable to wear and gives me the perfect hourglass shape - the hubby-to-be loves it. 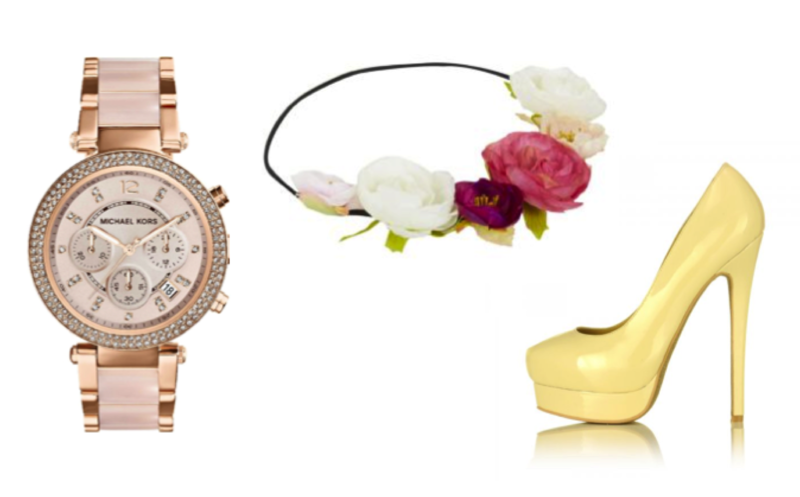 This outfit looks great styled with my favourite Michael Kors watch (link), my White Chocolate Kandee heels (link) and this floral headband from New Look (link). Have you shopped at Didi's Boutique before? I love your dress it looks amazing! Our dress is so cute and you look so chic Jessica! I love, love your outfit! You look adorable in that floral crown! So pretty with the dress, too! That is such a cute dress, but I am really in love with that watch.